Amy Warman works for DeVry Inc. and is a Senior Government Relations Analyst- Accreditation Policy. 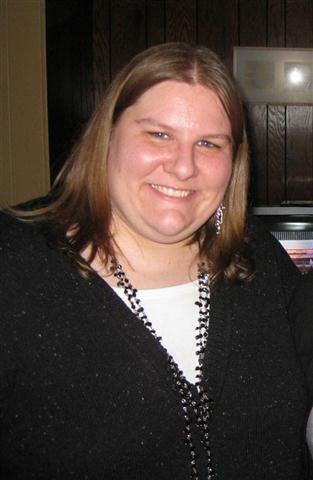 She is a 2003 graduate with an English/Writing Bachelor's and a Psychology minor. Click here to view previous alumni bloggers. How did you decide on your major/minor? For me, choosing a major was a bit of a bumpy ride. I went through 3 different majors before finally sticking with English Writing. I started my freshman year declaring Business as my major. But by the end of the first semester (and after trekking through Accounting and Macroeconomics courses), I quickly learned that a businesswoman I was not. At that point, I switched my major to Psychology because it was something that always interested me. (And with my mother being a psychiatric nurse, maybe it was in my blood!) I stayed as a Psychology major for a good portion of my time at Northern. However, in my junior year, I decided to take Creative Writing as an elective. This class was unlike anything I had experienced thus far (having taken primarily all business, psychology, and sociology courses at that point, I’m sure you understand). The class took place in the Public Safety building (for reasons still unknown to me); we sat in a circle instead of the conventional, boring rows; we talked about our feelings and expressing yourself was encouraged. That was it – I was hooked. Not long after that I took the risk and changed my major to English Writing and the writer in me was born. At least declaring a minor was easy; all of my Psychology credits filled the requirements for a Psych minor, so that was taken care of! Do you have any advice on what’s important to keep in mind when choosing a university? Bathrooms. I’m not going to lie and say that not having community bathrooms wasn’t a huge selling point for me when making this decision! It sounds so petty, but I promise you, spending one night in a dorm with community bathrooms after living the high life in NMU’s suites, and you will understand! In all seriousness, though, there are a lot of factors to consider. Here are two of the main factors that I took into consideration when making this decision: #1. Size of the school and the city where it is located. Northern was a perfect fit for me because it wasn’t so big that I would get lost in the masses, but wasn’t so small that it would be like another high school. And don’t forget to take into account the town/region where the school is located. While it shouldn’t be the most important factor, remember that you will spend your evenings and weekends outside of the classroom and you want to make sure you enjoy your surroundings! I come from a big city, so it was great to experience the nature and small-town atmosphere that Northern had to offer. #2. Distance from home. My advice is this: if your gut instinct is to stay close to home, find a school at least 100 miles away. If your gut instinct is to go to the opposite side of the country, scale it back a few hundred miles. College is a time of self-discovery and being independent. If you stay close to home in your “comfort zone”, it makes it a lot easier to shy away from opportunities that you didn’t even think you’d want until you experienced them. Would I have hiked up Dead River Falls if I had stayed in Illinois? Nope! And I would have lost a really great story that I actually just told again this past week! On the other side of the spectrum, be careful if your instinct is the extreme of “getting as far away as possible.” You’d be surprised how much it helps adjust to life in college as a freshman just to go home for a weekend here or there. Being 400 miles away, those opportunities were few and far between – but I was just close enough that they weren’t a complete impossibility. And it proved beneficial more than a few times. Most importantly, be sure that you are considering these factors against your preferences, not those of someone else (even if they swear they have your best interests at heart!). Did you end up working in the field of your major/minor? If not, did not majoring in your professional field hinder you in any way? My current job is not what you would traditionally consider “in the field of my major/minor”, like a writer, book/newspaper editor, etc. However, editing is a large part of my job description, so I do consider myself ending up working in the field of my major. My degree in English Writing was not what got me this job, but it has been a tremendous asset in helping me become as successful as I have. How did you get into your professional field? I started in a transcription position for a health care accrediting agency and was eventually promoted up the ranks to a position where editing was the primary duty. I then used the experience I gained at that company to move on to the job I currently hold. I still work in the accreditation field, but in education instead of health care. While editing is still a major responsibility in my current position, the range of duties has been greatly expanded. What skills are needed to do what you do? Most importantly, of course, my job requires good spelling and grammar skills. To be successful in my position, you must also be detail oriented, have time management skills, and be very organized. I work at a company that owns 10 different educational institutions internationally and I am responsible for monitoring the accreditation activity of all of these institutions, as well as program-specific accreditation for each school. This means I have to be on the ball with policies, deadlines, reporting responsibilities, etc., for over 30 different accrediting agencies. Being well organized is key! I have always been one of those people who, in their mind, can’t help but correct spelling and grammar in anything they read – brochures, books, advertisements, etc. For that reason, the editing portion of my job is what I enjoy most. I also like the diversity of the materials I review. One day I can be working with a nursing program and the next day an engineering technology program. It has really expanded my general knowledge base, which is a huge asset at trivia nights! At times, something I consider a blessing can also be a curse. With such a large variety of materials, the sheer volume can get a bit overwhelming. However, I’m also extremely lucky to work under an amazing boss who is also there to lend a hand when needed. When you tell people that you graduated from (or are attending) NMU, did they know anything about Northern? I live in the Chicagoland area, so not a lot of people I come into contact with are familiar with Northern or the UP. Typically when I explain where Northern is, most people’s reactions are “Brr! Too cold for me!” However, without fail, whenever I run into a fellow NMU graduate, Yooper, or even a friend/family member of a graduate, they always have the same excited reaction that I do. There is such a beaming sense of pride when people talk about Northern and the UP, myself included. If you had to pick a college again, would you pick Northern? Why or why not? This is the easiest of the questions to answer. ABSOLUTELY. I came to Northern on a whim – it was just the right distance from home, not too small but not too big, didn’t have community bathrooms, and the town was completely different from all that I knew. I was scared to death to take this leap of faith and abandon all that I was comfortable with, but it turned out to be the best decision I ever made. I had caring professors and advisors who helped and supported me when I was in the Honors program and on the top of my game as well as when I was on academic probation and hitting rough times. As part of House and Hall Government in the dorms, I felt like student voices really mattered – especially when my Spooner Hall government made a difference and had a Blue Light installed when our parking lot was displaced to make way for construction of the new Art Building. There were countless activities taking place on campus to keep students entertained when out of the classroom. I got to meet the band Train, which to this day remains my favorite band. I got to listen to the great Maya Angelou speak – twice. I witnessed the beauty of the Northern Lights on a group outing with my dorm. I took a road trip to Pictured Rocks early in the semester as another dorm outing and built friendships that are still treasured today, 10 years later. I could go on forever about my experiences at Northern and how much they helped me grow from a 17-year-old kid to a mature 21-year-old adult. I could have experienced the typical “college” life at any school. But I think the experiences I had by being in the UP, in a small nature town, and 400 miles from home are the ones that I remember and care for the most.